The American Institute of the History of Pharmacy is pleased to announce two Certificate of Commendation recipients for projects completed in 2017: Professor Megan R. Undeberg, of the University of Minnesota College of Pharmacy, Duluth, for her elective course for second and third-year student pharmacists called, “When Pharmacy Goes to War” and Trexie M. Rudd, Emily S. Braun, Lindsay N. Moreland, and Ashley O. Boone, 4th-year PharmD students at Purdue University College of Pharmacy, for their Proud to be an Indiana Pharmacist activity book for children. Prof. Undeberg’s course used historical examples of pharmacists during World War Two to teach students about pharmacy ethics. Case studies in the course included pharmacists in the French resistance, pharmacists in the Krakow Jewish ghetto in occupied Poland, an American pharmacist who served the needs of Japanese-Americans at domestic internment camps during the 1940s, and Victor Capesisus, the notorious “Pharmacist of Auschwitz,” who, along with Dr. Josef Mengele, was instrumental in the Selektion process at the Nazi death camp. by studying in this area, there are numerous lessons to be learned that can be applied to pharmacy practice. One of the key implications is prompting students to consider: when you are practicing as a pharmacist what will you do to safeguard the vulnerable, the weary, the frightened, the weak, and the poor? During the WWII era, many brave pharmacists took patient care to an entirely different level. The privilege and challenge is figuring out ways to learn from them and honor their choices. “When Pharmacy Goes to War” is meant to show students the impact of history and how it can be applied, with them being the architects, to impact the future of patient care and the profession. 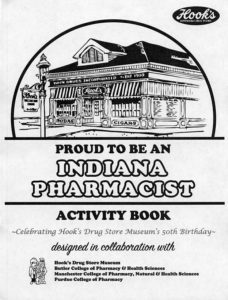 The Proud to be an Indiana Pharmacist activity book was originally developed in 2015 and then revised in 2016 to celebrate the 50th anniversary of Hook’s Drug Store Museum. The book is distributed each August to visitor to Hook’s, which is located at the Indiana State Fair. Proud to be an Indiana Pharmacist uses activities such as coloring, drawing, mazes, matching games, and word finds to introduce children to several pharmacy-related topics. Children completing the activity book will learn about the pharmacy profession, including medicine safety and pharmacy careers, the three Indiana colleges of pharmacy (Purdue, Butler, and Manchester), Hook’s Drug Store Museum, and pharmacy antiques featured at Hook’s, including show globes, pill rollers, mortars and pestles, and other vintage pharmacy artifacts. Over the 2015 and 2016 summers, Hook’s distributed more than 1,500 copies of the activity book to help introduce and educate children about the profession of pharmacy. The creators of Proud to be an Indiana Pharmacist have not been able to keep the activity book in stock, and some elementary school teachers have requested copies for their classroom. Congratulations to the winners for their important projects! Learn more about AIHP’S Certificate of Commendation program.